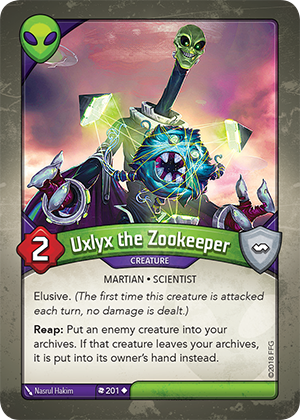 If I reap with Uxlyx the Zookeeper, do I have to put an enemy creature into my archives? Yes. You always resolve as much of an ability as possible. If you reap with Uxlyz the Zookeeper and there is an enemy creature in play, you must put an enemy creature into your archives. If there are no enemy creatures to archive, the “Reap:” ability does not resolve and you still get the 1 Æmber for reaping. What happens if after using Uslyx the Zookeeper’s “Reap:” ability to archive an enemy creature, my opponent plays Dysania (“Play: Your opponent discards each of their archived cards. You gain 1 for each card discarded this way.”)? All cards archived via Ulyx the Zookeeper return to their owner’s hand. Since they were returned to hand and not discarded, your opponent does not get Æmber for those cards.